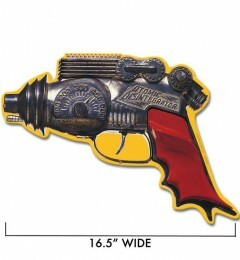 Retro A Go Go has all sorts of great, custom-made, metal signs, but today we’re focusing on three classic Ray Gun designs. Inspired by ultra-cool space toys from the 1950s and earlier, these large recreations will look great on your wall. They let people know that you’re willing to defend your home, but your preferred method is atomic-powered hand-guns. Hearkening back to the days of buck Rogers and Flash Gordon, these metal signs have the perfect sense of retro-futurism that makes us nostalgic for what the future used to be. The Atomic Ray Gun would let you zap and disenigrate anything that stands in your way!Harness the power of atomic energy to settle neighborhood disputes. It’s safe as mittens, but deadly, too. The Supersonic Space Gun overwhelmed your foe with a blast of sonic energy, possibly rendering them immobile or inducing severe bodily functions. 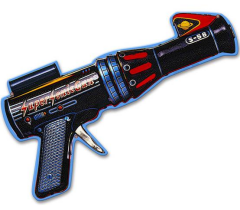 The Space Jet Gun would destroy your opponents with the fury of a thousand Jet Engines, leaving nothing but a smoking pair of space boots in its wake. 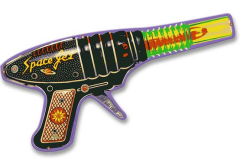 Who doesn’t love the retro look of rayguns? Blast your walls with some real retro coolness This die cut metal sign is great for fun kid’s décor or the young at heart.Be honest, you’re not going to put this in a kid’s room. Your PopCulteer is trying to find a blank spot on his living room walls for these beauties. Each plasma cut out metal sign is hand made in the USA using heavy gauge american steel and a process known as sublimation, where the image is baked into a powder coating for a durable and long lasting finish. There’s a hole punched for easy hanging! The signs range from 16.5″ to 19″ in size, and are colorful and nifty-looking. You can only order these from Retro-A-Go-Go, and be on the lookout, because we’re probably going to feature more of their great metal signs and other goodies in a few days. They cost $21.99 each, plus shipping, and are made-to-order, so you should expect a few days extra delivery time.